If you use secure (SSL) and non-secure pages on your IIS-powered web site, and are using session variables to hold information about your users, you most likely will find those session variable values disappearing as your user switches from non-secure to secure pages – for example, they are in your online shop, and then click to Checkout and Pay. The problem is IIS – by default it creates a new sessionId for users when they hit the SSL pages – so any session values you already created against the non-secure page sessionId are lost. It’s easy to fix, in IIS7 anyhow. 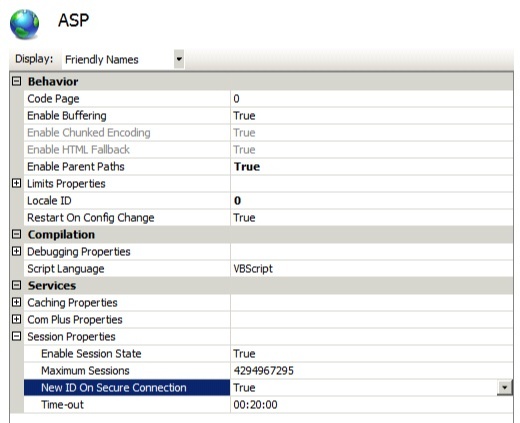 In IIS go to the properties for your web site and open the ‘ASP’ properties page. There is an option down the bottom entitled ‘New ID on Secure Connection’. By default this is set to True. Change it to False and click the Apply link. Switching between SSL and non-SSL can also be a reason users experience a time out, or seem to be automagically logged out in the middle of something. This entry was posted in Geeky, Programming, Web Development and tagged Classic ASP, IIS by David Eedle. Bookmark the permalink. This was a huge help, thank you!